The blogosphere is a weird place. It can make you feel as though you know someone when in reality, you’ve never even met. So today, myself and many other food bloggers are celebrating the wedding of one of our blogosphere friends — Steph from Steph’s Bite by Bite — with a virtual bridal shower. We’ve been following along with her on her wedding planning journey, and we’re excited to send her off into marriage (her wedding’s October 29th!) with a collection of date night-ready meals. I love making pizza at home. Not only is it easy and fun to make, but it’s a great opportunity to get creative with flavor combinations. While the standard sausage, peppers and onions are always welcome, why not try something new? Like this baby, for example. Not only is it the perfect combo of sweet and savory, but it also showcases some of fall’s best flavors. A great meal to cuddle up with on a casual night at home. If you have a pizza stone, preheat it for about 15 minutes at 500 degrees, then reduce temperature to 425. If not, preheat the oven to 425. Meanwhile, roll the pizza dough into a large rectangle of desired thickness. Transfer dough to a cornmeal-dusted pizza pan. Brush dough’s entire surface with 1/2 tablespoon of olive oil and season lightly with salt and pepper. In a large bowl, toss butternut squash, red onion, thyme, balsamic vinegar and one tablespoon of olive oil. Season with salt and pepper to taste. Layer butternut squash mixture over the pizza dough, then scatter the cheddar cheese on top. 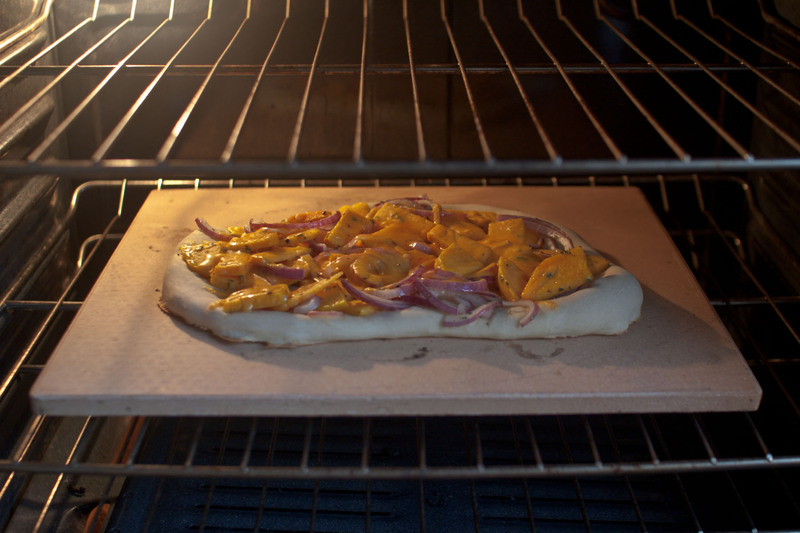 If you have a pizza stone, carefully transfer the pizza onto the preheated stone. If not, leave the pizza on the pizza pan and put it in the oven as-is. Bake for approximately 20-25 minutes (times will vary slightly depending on the thickness of your crust) or until the edges of the pizza are crispy and brown. Toss arugula with one tablespoon of olive oil. Top pizza with arugula and sunflower seeds before serving. Congratulations to Steph on her wedding, and a big group high-five to all the bloggers who participated in the virtual bridal shower. You can check out all their recipes here. This is such an interesting flavor combination and I’m pleasantly surprised to find the cheddar. Seems some of these specialty pizzas always want to get too fancy with the cheese. Cheddar and butternut squash are actually really great together. It surprised me, too. Yum!! What a great pizza! Love gourmet-ing up pizza to make it date night worthy! Butternut squash is my new favorite thing this season. I love all the fun ways it is being used, never thought to put it on pizza! This is why food blogging is so cool….Food I would never have even thought to try are presented in way I cannot resist. That looks wonderful!! We are crazy about butternut – must try this! Squash on a pizza?! You clever little monkey! PS. Arugula makes everything better… I’ll betcha you could sub toasted walnuts in exchange for the seeds too! I love squash and this looks like the perfect fall creation. The sunflower seeds seem like a really interesting (and delicious touch). I love the community in the blogosphere. Great friends, even virtual, are awesome. 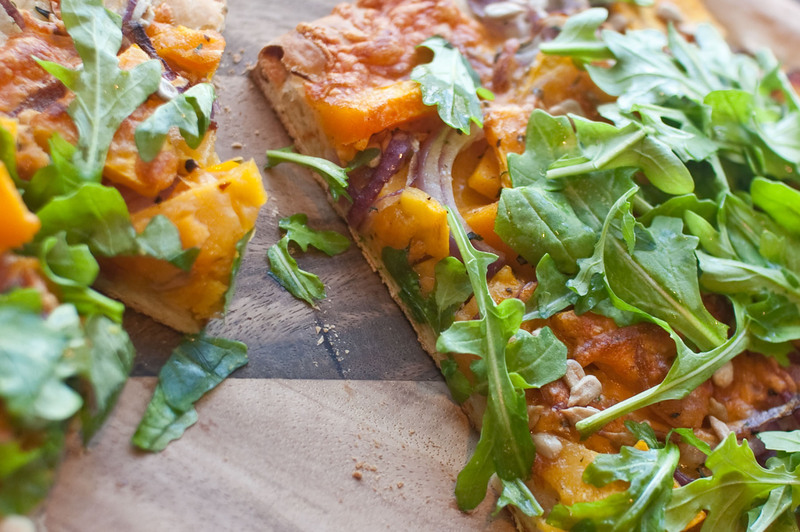 This pizza sounds awesome, I love butternut squash. I’m looking forward to sharing with you, I’m glad we connected through this shower! HOLY YUM! Thank you so much for this sweet surprise!! And boy how I wish I had this pizza in front of me right now! loving the butternut squash!! You all are so amazing! This means so, so much! Thank you so much for helping us throw Steph a great virtual bridal shower! Handsome and I love our pizza nights (though, we are often too lazy to make it ourselves). This pizza sounds delicious and much better than what we normally pick up at the local shop. I love this pizza, it looks so good. I love arugula with the sweetness of the butternuts quash, this combination of ingredients sounds to die for even in a salad. thanks for sharing! Fantastic pizza with awesome toppings!! I love your photos too!! Now that is a pizza! Wow, what a great combination of flavors. This looks like something that is perfectly lined up for my pumpkin obsession! 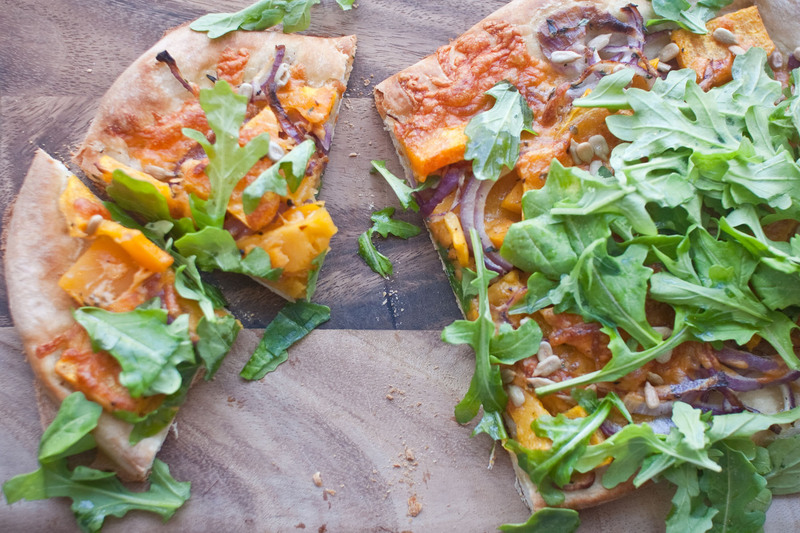 We love roasted squash on our “Friday Night” pizzas, but I’ve never considered using cheddar cheese. We usually opt for a mild Gorgonzola or a smoky provolone. This week we’ll be trying the cheddar. Thanks!